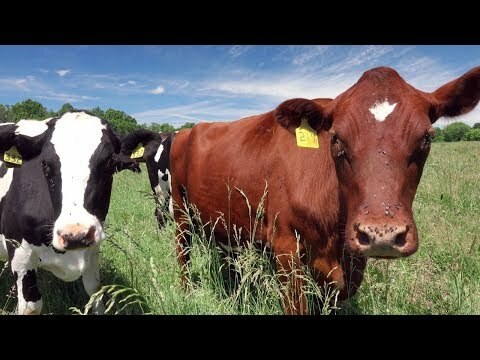 Share the post "Sustainable Farming on the Urban Fringe: A Winter’s Tale of Two Fields"
Two fields on opposite sides of the same road. Jack Rabin (CC ’78), NJAES director of farm programs, shares “Farm Calls” on the Sustainable Farming on the Urban Fringe blog. 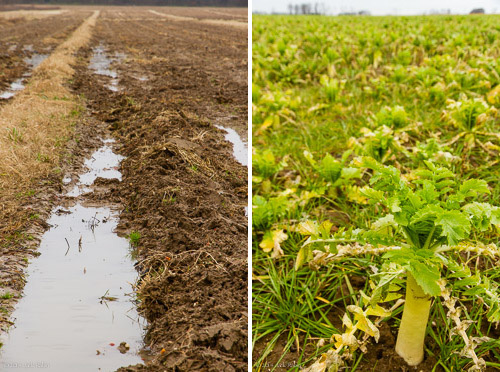 A picture is worth a thousand words in this post on cover crops. The thing is, many growers haven’t adopted cover crops. For example, take the fields I came across while driving down to a recent meeting. Who can resist checking out other farmers’ fields while traveling, whether it’s your neighbor down the road or fields far from home? On this detour, there were hundreds of acres seeded with a cover crop mix of cereal rye and oilseed radish (aka tillage radish). But, something caught my eye so I stopped to take a look. On one side of the road there were tractors working the far end of the field…in the rain, in December – excessive “recreational tillage” you might say. The fields were a mess with standing water and runoff flooding the ends of rows. Directly across the road, no standing water could be seen in the fields seeded to cereal rye and tillage radish. Not a pool or puddle. No flooding, even in low spots at the ends of rows where tractor turns cause compaction. Have better drainage enabling the grower to get on the ground and plant earlier next spring. Have lower Phytophthora blight crop losses, and lower fungicide bills, since disease starts in plants standing in water, at the low ends of rows where there is poor drainage. 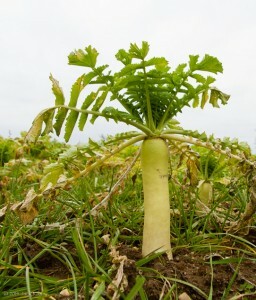 Have higher fertility because tillage radish scavenges nitrogen left over from the previous year’s crops. With all these benefits, why isn’t every grower cover cropping? We need to talk about cover cropping, and demonstrate how to do it, a lot – until it becomes SOP for every NJ grower. We first heard the term tillage radish when it was used by UMD Professor Ray Weil to describe the “biodrilling” property of its long taproot. Tillage radish scavenges residual nitrogen in early fall, penetrates deep into the soil and opens pores that improve drainage. After winter-kill, tillage radish conveniently rots away, leaving a field easier to till come spring.